Steve Lee: Up next this morning speaking to us is our main speaker, Dr. Brad Welling. And he has been speaking at the Ohio Gathering for six out of ten Ohio Gatherings. And we just love him and welcome him here this morning to talk to us about new research and new stuff that's happening with the NF2 clinic. And we're real excited about it this morning. And I'll leave it with Dr. Welling. Thank you. Thank you, Dr. Welling. Dr Welling: Thank you. Good morning. While we are working on this, I will tell you a story. I might have told some of you this story before. But it's very pertinent this morning. I have been in practice for 25 years, and I have been giving lectures for 25 years, and I still get nervous every time I give a lecture. And this is why! About 25 years ago, when I first moved to Columbus, I was asked to give a talk downtown to a group of family physicians. And because I was nervous, I thought I would be sure to be there well ahead of time. And my son had a soccer game that morning, like Steve Smith's daughter does today. And so I had been down at the soccer game in my Levi's, but I wanted to dress up for the presentation, so I had my suit with me. It was a light- colored suit, a light tan suit. I went to my office to check my slides. This is in the day when we used slides instead of PowerPoint. I might need to go back to slides! But anyway, I went to my office and checked on my slides and I realized that after when I went to put my suit on, that I didn't have my pants. I went back out to the parking lot and found I dropped my pants in the street. They had fallen off the hanger on the way in. Fortunately, nobody ran over them! Then I got lost going down to the convention center. At least I have my pants today! It was a very hot August day, and I had two trays of slides, and I was going up and down the streets in downtown Columbus trying to find the center. I couldn't find the hotel. Finally I asked a city bus driver where the hotel was. He told me but it was a different place than where I was. I had the wrong address! So I got to the hotel and I was a little bit late; and I was running to the room where I was supposed to give my presentation, and the heel fell off of my shoe! It was a bad morning! Okay. Well, good morning. It's good to be with you. You can see why I get nervous before every talk! I'm going to just go through a few of the things that we have been working on in our research over the past year, and summarize some of the other research that's being done to try to find better treatments for NF2. And I have no financial interest that I need to disclose to you. The drugs that I talk about today will not have any FDA approval, and so all of these are drugs that are still in experimental stages. So the summary is there are eight drugs right now in clinical trials for NF2. I'm going to talk mostly about three of them: Bevacizumab, Lapatinib and AR-42. 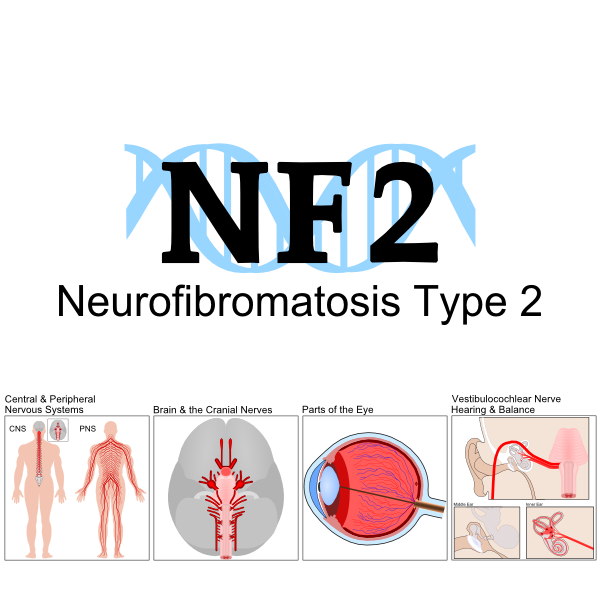 I think it's important and you all know this very well, that physicians and patients are well informed when selecting treatment for NF2. I will tell you that I spoke at a gathering of physicians in Dubai in the spring. And I'm sure you are better informed than that large group of physicians was. I also want to mention, I know that you all know this, but there's still a number of people in the NF2 community who don't recognize how important it is for early screening. So if you have friends that are diagnosed with NF2, make sure that children are screened early and put into the medical system. Our options for treatment are so much better when we detect small tumors than when we detect large tumors. 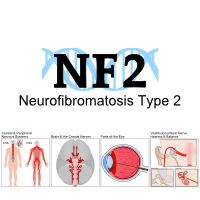 I don't need to review with you all of the signs and symptoms of NF2. I think you are all quite well aware. When we find tumors that are large like this, they are much more difficult to treat than smaller tumors. But these are the things that occur. I think you're well aware of those. Spinal tumors can also be a problem. 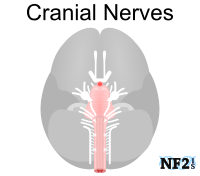 The large Meningiomas are associated with NF2 and occur in about 50 percent of patients that have NF2. 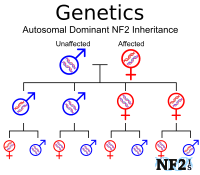 The gene for NF2 was discovered 20 years ago by two different groups: Trofatter's group called MERLIN, Rouleau's group called it Schwannomin. Dr. Chang put the two names together and calls it "SCHWANNOMERN." We combined the groups, and they decided they didn't like our idea! Speaker: There are two different names they are calling it, then? Dr Welling: Yeah. One group calls it MERLIN. The other group calls it Schwannomin. You will see both used in the literature after two years. You are all aware of the current treatment: radiation, surgery, or observation. We are interested in seeing what we can do to improve all of those. This is a busy slide. I won't take too long on it. I do want to point out a couple of things. And that is that when an NF2 diagnosis is made, we have to decide are there any symptoms with that. Usually these, the pre-symptomatic patients are those that are discovered who are children of patients with NF2. And usually their tumors are smaller. If they are small enough that we might have a chance to save hearing, we generally will recommend a hearing preservation operation early on. If hearing is saved, we will try to take out the second Vestibular Schwannoma. This is primarily focused at the Vestibular Schwannomas. With larger tumors, we will tend to wait and watch because we are less likely of saving the hearing. Sometimes we will recommend an operation to remove bone around the tumor to allow it to swell more without compromising the hearing. The exciting part of this chart is in red. There are currently various trials that people can help us with. 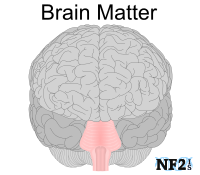 Some of them are designed only to get more information about NF2. Some of them may be designed to help stop or slow the tumor growth. The one last thing I want to point out down here at the bottom. When we are able to take out the tumors and save the Cochlear Nerve, there is an opportunity to consider a Cochlear Implant. If we are unable to save the Cochlear Nerve, than an Auditory Brainstem Implant (ABI) is an option. I know several of you in the group here have ABI's, so you are familiar with those. We like to try to take out tumors when they are small so we can save the Cochlear Nerve. The patients with Cochlear Implants do better than the ABI patients do. This is a patient who has NF2 that was discovered very early on. You could see the small tumor on the right side, and the small tumor on the left side. This is an ideal patient to try to take out those tumors and save the hearing. This is another view of the tumor. You can see in this view the spinal fluid around the tumor is white. And fluid inside the inner ear is white. This tumor has a little cap of fluid next to the inner ear. When we find that, it shows us that there is still a little bit of room around the tumor, and our chance of saving the hearing is improved when we have tumors that are that small. This is a patient who all of you know and love -- where is Phyllis? Phyllis? Speaker: She can't see the screen. Dr Welling: Steve? Steven Lee? Get Phyllis' attention for me. This is your audiogram when I first met you. No, it's not, I am kidding. I just wanted to see if you were paying attention! After we took out one tumor on the left side, the hearing dropped down. But the important thing was the clarity of the hearing was still 88 percent in the left ear, which is quite good. So we went ahead and took out the tumor on the other side. When tumors present at this stage, and there's a lot of tumor burden with brainstem compression and other cranial nerves involved, it's much more difficult to have conventional treatment options. Surgery is not really an option for this patient. I should say, if we do surgery on this patient, it would just be to try to allow more room for the brainstem. But this is very difficult to treat. This is the kind of patient where a drug treatment would really be useful. Now, all of you who followed my story of seeing this slide for six years, it's the same slide I have shown for the last six years. Basically it just tells you that we are not very fast at doing this work. I don't need to tell you that; you already know that. 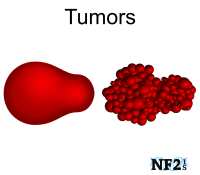 But on the average, and this is just not NF2, this is with all new drug discovery, once we understand what the underlying mechanism is of the tumor formation, it takes us between 6 and 10 years to identify those targets to shoot at. And then moving it into the early clinical trials takes a couple of years. Moving into Phase II where we get more patients involved and look to see if the drug is actually efficacious, the first study, Phase I, is really to look for safety; can patients tolerate the drug. After we have used it in mice and so forth, can real people tolerate it? Phase II, does it really work? Phase III is a large multicenter study with many patients involved. Even there is a Phase IV, after the FDA approves the drug, for post-approval safety and efficacy. Some drugs will be taken off the market after they have been approved if they are not found to be safe in the large population. There are some studies that are designed in the preclinical stage. Those are the tests we do against cell lines for Schwannomas and Meningiomas. In our lab, we don't test against Ependymomas and other tumors. Mostly we focus on Schwannomas and Meningiomas in our lab. The Phase 0 studies, we have a couple of those where we are asking patients who are having surgery to let us give them the drug for a week or two before surgery. Then when we take out the tumor, we check and see how much drug got into the tumor, and we look and see if it's hitting the targets that we're shooting for. So those are Phase 0 studies. Phase I is to check and see if patients can tolerate the drug. And we have a Phase I study going on right now I will tell you about in a minute. Phase II is to look and see if the drug really works. Phase III, multicenter. And Phase IV is post-approval. I'm not going to go through all of this. I am not going to go through all of the different steps. But this is just one of the pathways that affect the growth of Schwannomas and Meningiomas that we study. And up at this point, this is the cell surface for a schwann cell. This is where there is a receptor on the cell surface. This is one of the places where we can try to block growth factors from getting in. Laminin is the receptor. Another drug is AR-42, it affects the pathway for growth. It goes clear down to the nucleus and starts the replication process in the cell. AR-42 interferes here. AR-12 is another drug that we studied. This is one of many pathways that affect cell growth. .
We try to find the targets and select them. It may be that eventually we will be looking at a combination of drugs that would hit different pathways to try to help stop the tumor growth. One of the families of drugs is called an HDAC inhibitor. These regulate enzymes that affect growth. They work on tumor progression through the cell cycle. When cells divide and then split and grow into more cells, this drug stops part of that cell cycle. This type of drug has been shown to be anti-proliferative in several different kinds of tumors, solid tumors like breast and colon, and liquid tumors like Leukemia's. That's what they mean when they say liquid tumors. I'm not going to go into this in great detail. I want to show you, when we test this drug, this AR-42 against Vestibular Schwannoma cells, we can show that it inhibits their growth with a low concentration. The same thing with primary Meningiomas. This is a malignant cell line that shows good inhibitory growth and then benign Meningioma cell lines also are inhibited strongly by this drug. Then these are little blots that we run that show particular targets are being hit. And I'll just show you, it's kind of complicated. But we go through and look at a number of different blots. This is the cell cycle. We know where these drugs interfere with the cell cycle. It's interesting, this AR-42 blocks the cells from dividing right at the last phase here, in the G2M phase. The cells that get blocked in that phase tend to die off. In normal schwann cells that don't have Schwannomas in them and normal meningeal cells that are in the body, it acts in a different spot in the cell cycle in Schwannomas and Meningiomas. This is just a graph that shows more detail about how it blocks those different cell cycles. In addition to looking at where in the cell cycle the drug works, we also go through and look at a number of different pathways and try to determine exactly where the drug is working. And so the things I have listed here, P16, P21, these are all regulators of the cell cycle; and we look at a number of different ones to see where this drug seems to be appearing and how it's working. Then after we looked in the cells and we see that this seems to be a drug that may be effective, then we go to our mice. . There are two different kinds of mice we use: One type of a mouse is one that just doesn't have an immune system. We will take tumors from the patients and plant them into mice and treat them with drugs. The reason they don't have an immune system is because if they did, the immune system might attack the tumor and kill it. With the mice that are immunosuppressed, we take the tumor and implant it and treat it. This is an example of an untreated mouse. You see how rapidly the tumor grows in the mouse. This is one treated with AR-42. You can still see some tumor growth; however, it's must slower than the mouse that's untreated. The other type of mouse model we use is one that is genetically engineered to knock out the NF2 gene and grow tumors spontaneously. They take a lot more time and expense, but they are probably a better model for actually testing against these drugs. This is a summary of the mice that have control, in other words no drug treatment. You can see how the tumors took off and grew in these. And these are the mice that were treated with AR-42. So when we saw this, we were quite encouraged. It looked like the mice with AR-42 didn't have tumors grow at all. This is actually how we measured the tumor growth in mice. We put a little -- we attach to the tumor a gene that gives fluorescence. And so this is right after we inject the mouse with the meningioma cell line at 1 to 4 months. You can see the increasing bioluminescence. MRI scans are much more expensive than using the bioluminescence. Speaker: Can you check how it's affecting the other body parts besides the brain? Dr. Welling: We do. The question is, do we check other body parts to see -- other than the tumor, does the liver and heart and kidneys and everything, are they affected? We do those checks. We check in mice, and we also check it in dogs and other animals to see if there are any other effects. Dr. Welling: Side effects, yes, we do. I didn't put any of that in here, but we do that also. It's very important to know. So this is a slide of our mice that were treated with this particular drug, AR-42. And here we see tumors in all four of these mice before we start. It's scaled up a little bit on this panel and this panel. But the mice that were treated with AR-42 are in Lane 1 here. Lane 2 is mice that are the controls. Let me make sure I get this right. I lost it. There we go. So Lane 2 is the mice that are control mice, that didn't get anything. And Lanes 3 and 4 got a different drug called AR-12. Let's look at Lanes 1 and 2. Lane 1 got AR-42. You look at the mice there and you see over five months, there is no tumor growth in Lane 1. Lane 2, they got no -- in lane 2, there is substantial growth in the mice that were not treated. This graph summarizes the experiment. The mice in blue had tumor growth substantial. The mice that got the intermediate drug, AR-12 had intermediate growth. And the mice with AR-42 didn't have tumor growth at all. We were pleased to see that. This shows in that group that got AR-42, how quickly the tumors regressed. This is an MRI scan of the mice to show what the tumor looks like. The mice that were fed a normal diet have this little white streak. That's very much what a Meningioma looks like. That's called an en blanc Meningioma. The AR-42 mice have no tumor seen. Here you see another view of it. This is where we implanted the Meningioma cells, and they grew. You could see no growth on this mouse. When we look at the slides after the mice are sacrificed, we can look at the tumor. This is what a Meningioma looks like in the mice and in patients, too. It looks very similar. This is the normal side along here. Here is the tumor growth. Here is tumor here in the normal brain. Another question that's important for us to understand is, once you have treated the mice and the tumor stops growing, and then you stop the drug, will the tumor regrow? So here was the mouse prior to treatment. And then after six months of treatment, no tumor. And then we stopped the drug and followed for another six months. You can see over that time period, there is a little bit of signal there. But it doesn't seem to be growing. And so it seems like there may be an effect on the tumor out after the time we have treated them. But this will require further study. We don't know if that's true in patients yet or not. So here is a list of the drugs that either have been, or are currently on trial for NF2 related tumors. There is PTC-299 is a VEG inhibitor. VEG stands for Vestibular Epithelial Growth Factors. It's trying to keep blood vessels from growing. The upside to that, it could be given by mouth instead of intravenously. But it did have a rare serious liver toxicity, so this trial has been stopped and is not any longer under investigation. Nilotinib is another RTK inhibitor. That's out in the cell surface, trying to block growth factors from getting in. And I won't go through all of these. Let me just say Lapatinib is another drug that is an ERBB2 inhibitor. This is given for breast cancer. It can be taken orally. We have a Phase 0 study on this drug. We need one more patient to complete the study that would take this for ten days prior to surgery. And we take out the tumor and look and see how much growth there has been. Bevacizumab or Avastin is also a VEGF inhibitor, trying to block the blood vessels from getting to the tumor. It's administered intravenously. Just out of curiosity, do you mind sharing, how many of you or your loved ones have been on Avastin already? I imagine several. Yep, okay. Good. And then AR-42 is the drug I have been telling you about. I'll talk you to a little bit about the clinical trial on that. This website, the ClinicalTrials.gov is very useful. It keeps an update on clinical trials. That's when the government is working, though. If the government starts working again! So let me just summarize the three last drugs. Dr. Blakely, who many of you know, is a collaborator and friend at Johns Hopkins. She is the principal investigator on this study. We are involved with the New York University and Cornell, and HEI. The drug is given for 10 days preoperatively. The tumor is removed and we look at drug concentration and look at the molecular targets and see if we are hitting what we want to hit. We are giving this to patients not only with NF2, but patients with sporadic Meningiomas and sporadic Schwannomas. The reason we want to do that is because it increases the number of patients who can be on clinical trials. There are far more patients that have sporadic Meningiomas and Vestibular Schwannomas than there are who have NF2-related Meningiomas and Schwannomas. Also it makes the drug companies more interested in working with us if we have a bigger patient pool. Just as Tracy was saying earlier, we want as many people we can to tell the drug companies we need new treatments for these. The next drug I want to mention is Lapatinib, Dr. Karantanis at New York University is the principal investigator on this study. He completed this last year, where he gave Lapatinib to 21 patients with NF2. 17 of them completed the study. The primary end point of this study was for the tumor to decrease 15 percent by volume. .
Now, I just would mention that these studies are a little bit tricky because when a patient has a malignant tumor that's rapidly growing, if you can show you are decreasing the size of the tumor, that's a good thing. With NF2 and Vestibular Schwannomas and Meningiomas in general, if we could just stop the tumor from growing, that would be very helpful. For many patients, that would be enough. But the people who fund these kinds of studies are not used to that as end point criteria. So even though he showed that only 4 out of 17 had shrunk the tumor, if there were a number of them that stopped growing, which would be a significant effect. We have to keep both of those end points in mind. One is we tell the funding units that we will look for a decrease in volume. But if we see it stops tumor growth, we are good with that. The secondary end point that he looked at was hearing, improving the pure tone average or speech discrimination score also occurred in 4 out of 13 patients. Again, that's very interesting. So his conclusion from this study was, maybe this is a drug we could use in combination with other drugs. This one hits that target at the cell surface. Maybe this with another one that's working inside the cell would be useful together. Now, another study that's been published recently was by Dr. Plotkin from Massachusetts General Hospital, where he did an off label study. When you say off label, you mean the FDA has not approved this drug either. He gave the drug and then did a retrospective review of the patients. This was published in August of last year. He showed 13 out of 23 patients, with 57 percent, showed some response in their hearing and 17 out of 23, or 55 percent, showed some response of their tumor to shrinkage. And at three years, 61 percent had stable hearing overall. To me, that's miraculous, because very seldom do we get hearing back when the nerves have been involved. So when he first published this, I wasn't sure I believed it. But other people have also shown this, and it seems to be real. It may be just the compressive effect against the nerves; when the tumor shrinks a little bit, the nerve function improves. We know when we put pressure against a blood vessel and cut off the blood supply to the inner ear, the function drops down, and that doesn't come back very well. So it appears from this study that the effective hearing loss in a number of patients has to do with compression of the nerve more than compression of the blood vessels, which is interesting. I think those of you, who have studied this, there are potentially serious side effects with it. Overall, none of his patients had any serious complications from the drug, like bowel perforation, for example. That also was encouraging. Another study on the same drug has been done by Blakely. They are doing a Phase II prospective study. In other words, not just giving the drug and looking back to see how patients did, but they are carefully following patients as they go forward. And I think they completed the enrollment on this study. In general, their findings are similar to what Dr. Plotkin reported. That's also very encouraging. They found that they do have some patients who get recovery of their hearing, and some patients who have some improvement in their tumor size. They have also looked at a number of other things that are important, particularly I think quality of life is very important. How do patients tolerate the drug? How do they put up with having IV injections and so forth? Those are all things very important to consider. We just presented in Vancouver last week our quality of life on patients with Vestibular Schwannomas in 645 patients. The quality of life is a very important marker. So in this study that Dr. Blakely was doing -- actually, this is a summary of a new study that Dr. Plotkin has initiated that allows children 12 years and older, from 12 to 30. This is the first study on Bevacizumab in children. Our center is also one of the participating centers in this trial. This outlines how much drug will be given and so forth. We are looking at hearing and also response. The Department of Defense has kindly funded this for us. Do any of you know, most of you probably do know why the Department of Defense funds NF2 research? Anybody know? I wondered about this for the longest time. Every year when I go and sit on their review panels to review the grants and everything, somebody from the army would get up and talk about the army's interest in funding these studies and so forth. It took me about ten years to find out that a senator's child had NF. That's how funding got started. I am not sure if it has more concentration in the military people. But I was glad that they funded it. It's been very helpful for us. This is a patient here in the room that had Avastin. You can see after a year of Avastin, improvement in the expanse of the brainstem. Much less uptake of contrast. A little synopsis on the AR-42 clinical trial that's going on at Ohio State. This is a Phase I clinical trial. We are trying to find out if the drug is tolerated by people. So it's given three times a week for three weeks. Then we stop for one week and let people get to feeling better. Those of you who have been on AR-42 know that it can be a bit of a difficult challenge to get there and get all the testing done. It's not easy. So not only are patients with Vestibular Schwannomas and Meningiomas in the study, but patients with Multiple Myeloma, CLL, and Lymphoma also were in the study to help us determine the safety of the drug. What we are doing in a Phase I is slowly increasing the amount of drug that patients get. So if one group of patients will come in and get 40 milligrams, the next group will come in and get 50. And we go up until we reach what we call a dose limiting toxicity, when it's so high that people can't tolerate, and then we back down. We are at that stage now where we reached the dose limiting toxicity. We are backing down and putting patients in the lower level. Right now we have 21 patients enrolled in the study. Five of those patients have NF2. Two of them had sporadic Meningiomas. Overall, 7 patients we are interested in, in terms of their clinical diagnosis. The most common side effect is a drop in platelets in the blood. 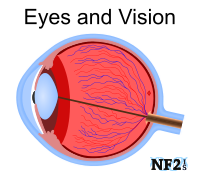 This has been more common in the patients that did not have NF2. It's more common in patients that have other type of malignancies like Leukemia that normally get drops in their platelets anyway. We had one patient who reached that dose limiting toxicity who had some altered mentation, altered thought processes. When the drug was lowered and came off, that recovered quickly. That may be one of our limits that we don't want to get to. Interestingly, this type of a drug, this AR-42 falls into a bigger family of HDAC inhibitors. This one seems to be much better tolerated than other members of that same family. I'm just going to share with you a case history of a young man who is 28 years old, has NF2, and has been diagnosed for some time. He had the first Vestibular Schwannoma or left CPA tumor removed in 1995, and had a left Optic Nerve resected in 1997 and a Meningioma removed in 2003, and the right CPA decompressed in 2004. He had the bad misfortune of falling and has a fracture in his neck in a vehicle accident, and it left him a quadriplegic. Thankfully, he recovered from that. 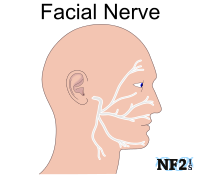 It's not bad enough just to have NF2, you also have to have quadriplegia to go with it. So then he had a left Cochlear Implant put in, even though they only removed part of the tumor. They got about a third of the electrodes in. He started Avastin; he was on it for five years. And then his hearing continued to decrease slowly. And by May of 2012, they decided that the Avastin was not holding the tumor in check. So he went on a short trial of RAD-001 over the summer, finished in September. He has not had any radiation treatments. He was still able to use a hearing aid and get some help on the right side. He was not using his cochlear implant on the left side. But he recently restarted using the Cochlear Implant, had some problems with imbalance, I think as expected, but was doing remarkably well and didn't complain of any overt dizziness. So to summarize, his hearing, he has profound hearing loss in the left ear; profound hearing loss in his right ear with a little bit of residual, and 0 percent speech discrimination. He started the AR-42 trial in December of 2012. Here are his tumors. This is a large right Vestibular Schwannoma and a small residual left Schwannoma. And you can also see behind his residual Schwannoma here is a Meningioma. The way you can tell it's a Meningioma; it has a little tail that attaches to the meninges here. He also has an Ependymoma in the fourth brainstem ventricle here. So when we look at a coronal view, you could see the Schwannoma shifting the brainstem over, the other tumor pushing back on this side, and then a lower Meningioma here that's also putting pressure down in the cervical region of the neck. We keep -- as he went on the AR-42 study, I think the most critical measurement we were interested in was how much brainstem compression does he have between the tumors. Right here we are measuring about 8 millimeters. That's pretty thin. Less than half an inch. This summarizes his early treatment with the AR-42. When we looked at the large right Vestibular Meningioma, it shrunk initially a little bit. The left Cervical Meningioma and the upper one both shrunk the most. The Ependymoma in the middle of the brainstem didn't change at all. The left Schwannoma continued to grow. This summer, his right Schwannoma, which I haven't included, it looked like it had some degenerative area inside of it. But the volume went back to where it had started in November. So at that point we decided it should come out. So he has had his largest tumor, the right Vestibular Schwannoma, removed. This shows a summary of the volumetric - the smaller Schwannoma on the left side is this one; it continued to grow. All these others stayed the same or got better over the first four or five months. But because he had that narrow critical area of the brainstem, we decided that surgery would be important for him. We were fortunate to have the early molecular work published in cancer research on this particular drug. You know, we have also had an interest in looking at other types of substances that occur in herbal treatments. They call it Phytotherapy. Many of you are familiar with these. I always get in trouble because we haven't tested enough of them. But we have looked at some of the more popular ones: CAPE, Bio30, Sulforane in broccoli, and Resveratrol in grapes and red wine, and curcumin, turmeric. High doses of these didn't affect the vestibular Schwannoma or the meningioma growth in the cell cultures. We didn't test these in mice. Maybe these have an effect on the blood vessels and maybe they are effective for that reason. That's possible. But we weren't too encouraged by what we saw in our initial screening. We have screened a number -- we have about 30 naturally- occurring elements that we have screened. One of them that seem to be quite encouraging is Silvestrol. In fact, the National Cancer Institute is also interested in Silvestrol. It seems to inhibit a number of different kinds of tumors. It has been moved up on the priority list as an important one. When we tested it in schwann cells in NF2 mouse Schwannomas and primary Meningiomas and these benign meningioma cell lines, it has very effective potency against them. Also this year we found a couple of new ones: Cucurbitacin D and GOYASENSOLIDE (spelling?) are found in plants and seem to have potent inhibitory effects. So much of the Silvestrol comes from Malaysia. It's potent against acute Lymphocytic Leukemia cells, as well as VS and Meningioma cells. It seems to inhibit the nucleus of the cells from proliferating. It's orally available, which is nice. The difficult thing about Silvestrol is it's in a tree bark in Malaysia. In order to purify it and study it, we have to ship tons of tree bark over from Malaysia. The last shipment was two tons of tree bark to come in to extract the pure compound so that we could study it. This shows the chemical structure of it. One of the things that's important for us to think about is, are these drugs small enough that they can get through the blood brain barrier into the tumors. Silvestrol is kind of a big drug. I mean, those of you who have chemistry backgrounds can see all of these rings and say, that's not a simple drug; that's kind of a big drug. One of the things we worked on this year is finding what part of that is essential for blocking the cell growth and making the drug smaller. So we have several different drugs that are derived from Silvestrol that are smaller. They are much less expensive to synthesize because there are fewer steps, and they do cross the blood brain barrier better. It may be Silvestrol is good for colon cancer. But for Schwannomas or Meningiomas, we might have to use the smaller version that gets through the blood brain barrier. GOYASENSOLIDE is a plant that comes from the Dominican Republic. It seems to be quite potent against colon cancer. It does inhibit Schwannomas. We published this in October, this month. And Cucurbitacin D also was found to have effectiveness against Vestibular Schwannoma and Meningioma. So here is our publication of October 2013. I should acknowledge Dr. CHANG and Dr. Kinghorn, who sends his people out to the jungles of the world to find these new compounds. Dr. CHANG is the one doing a lot of work in the mice. So I'm winding down here. You have been very patient. Clinical considerations: 1) What do you think about when you are deciding how you are going to treat your tumors? 2) Well, first of all, of all the tumors that we are looking at, which ones are the most dangerous? 3) Which ones are likely to cause problems? 4) What are the present and potential side effects of the drugs we are using? 5) What are the potential side effects on the nerves, if we treat or if we don't treat? 6) Also in terms of being involved in these clinical studies, location and ability to travel and work schedule, and all of these things have to be considered. Because they are very difficult to be in, as some of you know. They are time consuming. We appreciate everybody who can make the time and effort to come and help us with these. You have to meet the eligibility criteria. 7) Insurance is important, too. Because we make insurance pay for whatever we would normally do in the treatment of these tumors. And it helps to keep the cost down. If we have to pay for all the clinical care in the clinical trial, it really drives the cost up. If the insurance companies would normally pay for an MRI scan every six months, we ask them for pay for that. If they would normally pay for the surgery, we ask them to pay for it. We don't want to have to try to take research funds to pay for things that are normal clinical care. There are many unique challenges in NF2. I don't need to explain this to you; you all know this. We have to be careful how we define success. If we can stop tumors from growing, I'd say that's a success. We have to decide what we are going to use based on what we know from the underlying targets. And we have to decide, is this a sustainable treatment or not. If patients don't tolerate it, we can't really use it in NF2. If you're dying of Lung Cancer, you'll take a drug that makes you feel crummy. But NF2 doesn't actually make you feel crummy; it just gives you problems. If we can give you a drug that doesn't make you sick to take, it's much more likely to be a successful drug. Also cost is a consideration. I know that I have had some patients where their insurance company said we are not paying for any more Avastin. You have been on it a year, that's long enough. This is not an FDA approved drug for this thing. If we can find a naturally-occurring element that is something you can take in your broccoli that would be wonderful. We haven't found that yet, but we are working on it. 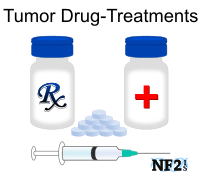 Also we love a drug that would treat multiple different tumor types associated with NF2. That's why we check different tumors against the same drugs. If one drug is effective against one tumor and a different drug is effective against another tumor, we may still use them. But it would be ideal to find drugs that are effective against the different tumors involved. . It's difficult, as you all know who have been here before and asked me questions about this, it's expensive to do the research and difficult for us to know which drugs to target. We try to use the best information we have to follow these lines. But we are testing 10 drugs. We would like to test 100 drugs. The more effective and efficient we can be, it will help us to know how to best test them. To summarize, there are eight drugs that I am aware of that are under clinical trial. Some of these are naturally-occurring elements which appear to be useful against Schwannomas and Meningiomas in NF2. There are other drug candidates that we are prioritizing, trying to do that in a reasonable, logical way. It's really important for you as the NF2 community to inform your physicians, which is very helpful for us. You do all the study. We get the benefit from that. And be careful when you consider the treatments. And then, of course, be aware that the early screening is important for family members. The future directions: We want to continue to take what we know from the laboratory and get it into patients. As quickly as we can, we want to move promising drugs to clinical trials. Also we are starting to consider combinations of drugs. Like I mentioned, Lapatinib may be effective in one spot. AR-42 may be effective in a different spot. Together maybe they are effective. Also some of these drugs increase radiation sensitivity of the tumors. So this is another thing, can we use these drugs in addition to radiation and surgery to get a better outcome. We are working on that. So in addition to the drugs we know, we are still looking to try to find new drugs and new targets that may be more effective. So we just published a paper on a new line that we are interested in studying. Of course, we are interested in accessing the world's small molecule library to find the most effective treatments and natural inhibitors. This is a study this year we published on a group of drugs called LIM domain kinase inhibitors with collaborators out in Florida. It's a new line that we are interested in studying more. I'll end by thanking those who have helped with funding not only NF2 related groups, but the National Institutes of Health, the National Cancer Institute, the Department of Defense. I especially want to thank you because it's because of you that we do this work. And I think that all of you have contributed a lot to the research, a lot to helping to move forward the treatments of NF2. I appreciate knowing many of you as patients and thank you so much for your help! I will end there. I have one more slide to show you, wait a minute. Here are our collaborators, lots of good folks to help us. And this little guy has NF2. He has inherited it from his father. We hope by the time he needs treatment, we will have this as a potential treatment for him. Then just lastly, my family, I want to show you, they can spell Ohio under water! Okay. I'm actually in there, too. That's me on the end. Questions? Speaker: Have you found out anything new about Honokiol and Dr. Lee's research? Dr. Welling: The question is, have we found out anything new about Honokiol. Dr. Lee from Korea has been doing work in this area. I went to Korea twice this year and presented our work and met with Dr. Lee. I don't have too much new information about Honokiol. We have encouraged him to use some different cell lines than what he had done his original test in. I don't have too much of an update, unfortunately, that I can give you about that. Speaker: What do you think of the potential of focused ultrasound for delivering drugs or treatment? Dr Welling: The question is, what do I think of the potential of focused ultrasound for delivery of drugs and treatment. I think that this question is an important one. I mentioned it earlier that we want to make sure we get the drug into the tumor. And so focused ultrasound is a way to try to increase the permeability of tumors. I think we will learn more about this because there are many patients with tumors that would like to increase the drug concentration in their tumor, not just in NF2 patients. But I don't have any personal experience with it yet, so I can't tell you very much. I think it's a potential to help us. We would love to increase the tumor concentration of a drug and not have the rest of the body get too much of it. Dr Welling: Is the question when to treat on these things? Yeah. That's a good question. That's a tough question. And I think that it just takes good clinical judgment and an experienced team to try to help work through that. Sometimes when we don't have definite answers, we just have to weigh all the risks and potential benefits and then move forward. Sometimes it's not useful to look backwards, you know. I mean, you do the best you can at the time, and you pray that it's the right decision. Sometimes it is and sometimes it's not. But all you can use is the best information you have and make the best decision you have at that time. So I don't think there's a good answer to your question. But we do try to be as conservative as possible, but we have to preserve life-saving function in the brainstem, and we certainly are trying to preserve other function like facial nerve and hearing if we can as we go along. Speaker: Yeah, because we have - we should be on Avastin, and not yet. It's overwhelming. Dr Welling: Yeah. It's good to get several opinions. I know it can be confusing. I would encourage you to get to places where they treat a lot of it. I think it can be more confusing if you get information from people who are not expert in the field. Speaker: We are at the Cleveland Clinic. Dr Welling: Yeah, those guys don't know anything! No, I'm kidding. No, that's a very good treatment center. They have a very good treatment center. Speaker: You don't think the herbs do anything, so I was wondering, do you think I should try the new drugs where you talking about Silvestrol? Dr Welling: The question, if I understood you was, are on several of the elements that I said didn't really help or we don't have any evidence that shows they help. I also don't know that they hurt. So I don't know that it's bad to take Curcumin or turmeric and so forth. However, Silvestrol is not yet available for patients. We are still using it in animals. But some of the other drugs may be a consideration for you. Without knowing your particular scenario, I am not sure I can answer that question. That's a complicated question, and I don't have enough information to answer you well. Steve Lee: That's all the questions we can have for right now. We have Phyllis with something.